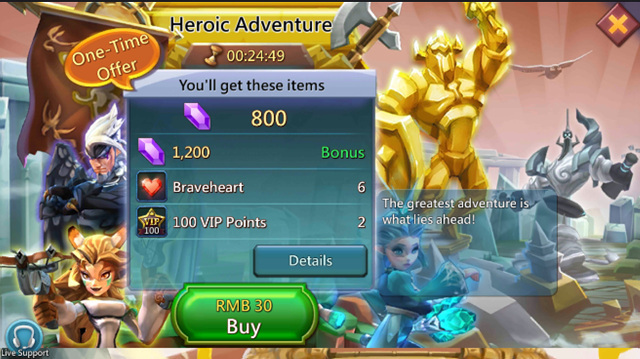 Lords Mobile: What P2W Heroes are Worth Buying? When it comes to Lords Mobile, we always think of how important it is to have a powerful hero, and as we all know there is no BEST hero, it all depends on game modes and what you want to be. This article was written by laststandb and it's going to recommend some P2W heroes to you. It will tell you which ones are worth Buying, and what levels to buy them too. This guide is targeted at the players who are wondering which $5 packs to buy. Make sure you are buying the braveheart packs before you go down the P2W hero line. The $5 braveheart pack is the great value, and the $20 is good too if you constantly find yourself buying Bravehearts with gems. "One-Eye no stupid! One-Eye strong!" 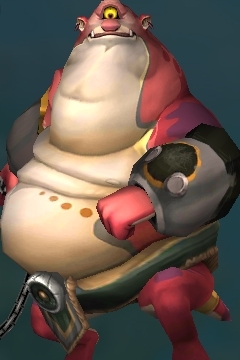 Big Guy is the First P2W hero you should get. Big Guy hero can be purchased after you buy the Second "Winning Start" package for 4.99 $. This package will give you 20 medals so you only need 10 for the next rank (blue). Construction speed is nice, and he provides a large amount of infantry attack and HP which is very important. It will take a long time before you replace him. Army Heroes are the ones that give Army Attack, the best Battle Skill in the Game. These are the heroes you should focus on as they are the endgame heroes. You want all three of these heroes at gold eventually, as they are are only heroes that have 3 army stats. Lore Weaver – "Everyone deserves a happily ever after." It must be bought when their package is available in the store. It will give you 10 medals for $4.99 USD and give you enough for the common grade. She is a great Army hero and great in colosseum. Berserker – "I'll make your blood run cold!" 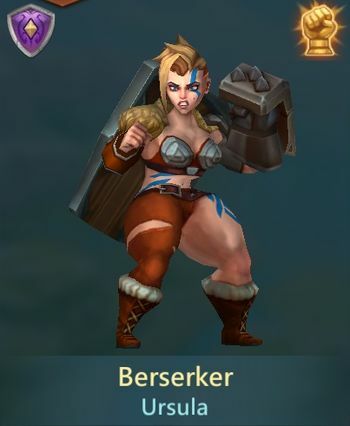 You can buy the Berserker package for 4.99USD to unlock the common grade version.This package will give you 10 medals so you only need 20 for the next rank (green). Great Army hero and Great in Colosseum. Songstress of the Sea – "Home feels so far away…" Great Army hero, $5 gives you 15 medals, $20 gives you 18. 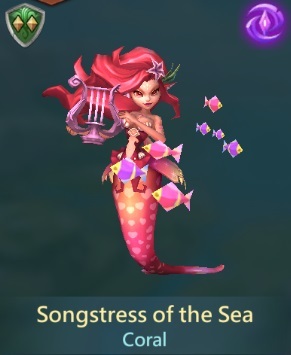 Cost goes up significantly with the $100 packs, so Songstress is the best army hero to delay as the cheaper packs give you more medals, and the large packs don't give very many medals. If you combine these with the F2P army attack heroes Rose Knight and Bombing Goblin, this will give you 5 army attack heroes and will make your hero lineup very scary. 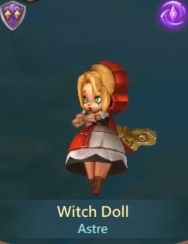 Witch Doll – Witch Doll is a crazy good hero, she gives MP so your skills go off first, and she has a 5 second petrify. She also gives Construction, research and training speed. Grey/Green is good enough too, but since her administrative skills are so good you want to take her to gold. Grove Guardian – Grove guardian is a Good anti spellcaster hero. Grey is good enough, so just pick up the $5 pack when it appears. I do not recommend pouring lots of money into this guy, there are many F2P ranged heroes that are almost as good as him if you want him for your army. Twilight Priestess – "It's always darkest before the dawn!" The Twilight Priestess hero can be purchased when you buy the package for 4.99USDThis package will give you 10 medals so you only need 20 for the next rank (green).Within the package, you have additional resources. That can help you further progress in the game. A gold research hero takes 330 medals and gives 25% research boost. A green research hero takes 30 medals and gives a 2.5% research boost. So green research is a good balance if all you want is the research speed for the early boost. I personally buy the $5 pack of research/training speed heroes. If the pack gives 15 medals, it will only take 2 rotations to get you to green. 1. Dark Follower – 15 medals for both Research and Training Speed. 3. Petite Devil – 15 medals for research speed, good in colo, and a decently ranged army hero. 4. Prince of Thieves – 15 medals, and gives you research speed. He has army attack, however, he gives army def which is much worse than army hp. 5. Dream Witch – 10 Medals, she has army attack and army hp as well as training speed. However, she is very expensive to buy in gold in one go. 6. Vengeful Centaur – 15 Medals for research speed. Previous Previous post: Lords Mobile Merchandise is Now Available on the IGG Store! Next Next post: Lords Mobile Festival of Love Event Preview: Feel the Love! Sweet Heart!